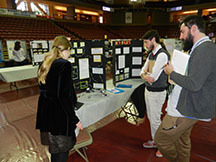 The Lowcountry Hall of Science and Math is pleased to announce the 2015 Lowcountry Regional Science and Engineering Fair for Tuesday March 24, 2015 at the TD Arena. Please mark this date on your calendar. If you would like to pursue this route rather than the classic science fair (which is totally acceptable as well), I will be more than happy to help you and your students in any way that I can…determining a question, finding a scientist or engineer mentor (at a local College), obtaining equipment for collecting and analyzing data, etc. Please let me know! To participate in the regional science fair, you would need to select 2 students to represent your classroom at the fair. If the project wins, instead of the student(s) getting an award, the classroom would be get the award. Again, there will be the classic science fair; however we would like to begin moving in a new direction. I strongly encourage you to take advantage of the new science standards and this new approach to science fair.